As of July 11, Tim Rogers, City of Murphy Public Services Director said that the city had 25 reported leaks. Of those 25 leaks, six remain to be repaired. He said most of the leaks have been in the northwest portion of Murphy due to the copper lines that were installed in a rock embedment. The copper lines are not as flexible as poly pipe and when they vibrate due to the active soil, holes are rubbed into the lines. He said there are less leaks in the older parts of town because the lines were laid with a sand embedment, not rock. Rogers said that the leaks have increased over time because of the aging infrastructure. He said there is no predictability as to when or where the next leak will occur. He requests that residents call City of Murphy customer service (972-468-4100) immediately to report leaks. He said someone will check on the leak within 45 minutes of the call. When staff arrives, they will do a pressure test to see if the leak raises public safety concerns. Extremes in pressure, either high or low, will determine the priority level of the leak. Leak at 100 block of Sherwood in Murphy. Since January 2018, leaks have been repaired at (block numbers, not exact address) 1200 Saddle Brook Dr., 200 Justin Dr., 500 Waters Edge Way, Rodeo Dr., Lake Field Dr., 400 S. Murphy Rd., 600 Sunset Dr., 200 Ponderosa Trail, 300 Thomas Dr., Ashley Place, Holly Court, 900 St. Peter Dr., 400 Englewood Dr., 1000 Sleepy Hollow Ct., FM544/ N. Murphy Rd., 200 Amanda Ct., 1000 Willow Point Dr., 1000 Mockingbird Hill Ct. and 800 Nighthawk Dr. There are currently six leaks remaining which are prioritized and scheduled for repairs by the end of the July: 600 Memorial Hill, 500 New Castle, 100 Sherwood, 300 Idaho (2) and 400 Rocky Glen. Repairs will cost between $2,000 - $3,000 (estimated) per leak, depending on the job. These costs are incorporated into the budget. Rogers stressed the importance of staff safety during these repairs. He said the combination of a confined work space, working on the street and the possibility of hitting a utility line creates a dangerous work environment. Sometimes work will be delayed while waiting on utility line locations. Rogers said there is no danger of sinkholes forming at these leaks, but it could cause a pothole. Staff does not know exactly where the leak is until they cut into the concrete and chase it down. Once work has begun, it typically takes around a day and a half to make the repair. 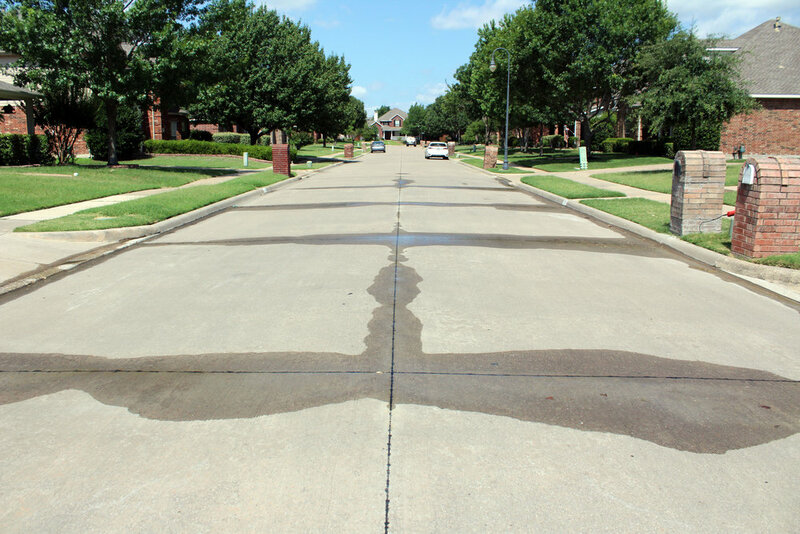 A leak located on a cul-de-sac took three days to complete. Crews will be called off a leak repair if an emergency, such as a sewer backup, occurs. Poly pipes are used to replace the damaged pipes. Once the leak has been repaired, the hole will be covered, but the sidewalk will not be immediately repaired because the crew that fixes the leak is the crew that fixes the sidewalk. They will move to the next leak before returning to fix the sidewalk. Rogers said they have on occasion outsourced sidewalk repairs. Rogers explained that approximately 40 thousand gallons of water was wasted due to the water leak caused on June 26, during construction on the signal light at FM 544 and Murphy Rd. (TxDOT is making improvements to the signal; replacement and relocation of signal poles.) He said 40 thousand gallons of water is on the high end of the amount of water a Murphy resident uses at their home in two months. By July 31, it is estimated that the City of Murphy will be 110 million gallons over the cap which will raise the base water bill by $4.11 a month per Murphy household. Rogers said these numbers are an estimate and expects to have the final numbers soon.